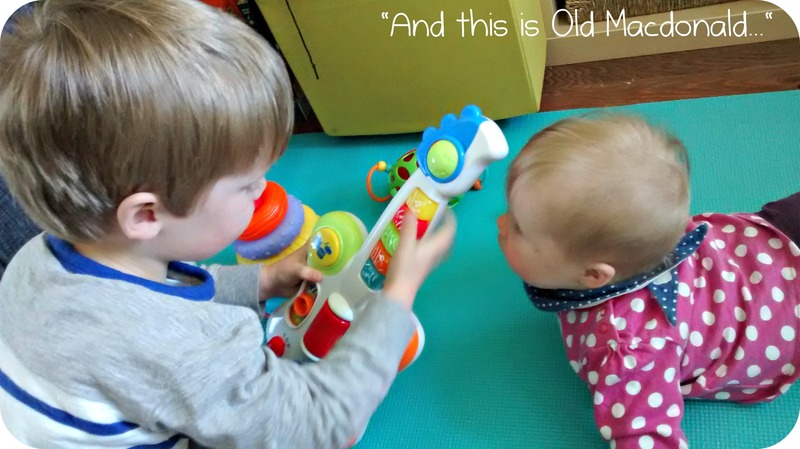 entertaining toddler – Mummy DON'T say that! This question is one of the first to be spoken by The Boy pretty much every morning upon waking, and after every nap. Today, it got me thinking. Are we guilty of spoiling him with activities, outings and attention? We have just spent an entire weekend based in the house and garden. I honestly can’t remember the last time we did that. Oh, wait, yes I can: it was when we were in chicken pox isolation a few weeks back. But believe me, it hardly ever happens. This time, we didn’t necessarily plan to stay at home; we were just busy trying to Get Things Done. Going away for a couple of weeks can often have that knock-on effect can’t it? The house desperately needed cleaning from top to bottom; our freezer of homemade meals (that’s how we generally roll folks) was severely depleted and Pipsqueak needed some purees making up; our kitchen cupboards were shouting out for a tidy (every time we opened them, tupperware lids and baby bottles would fall to the floor as we are forever shoving things away with too much haste); the garden needed weeding; the last couple of days of rainy weather had meant that the laundry pile had begun to overflow again…you know, The Usual. The Mundane. 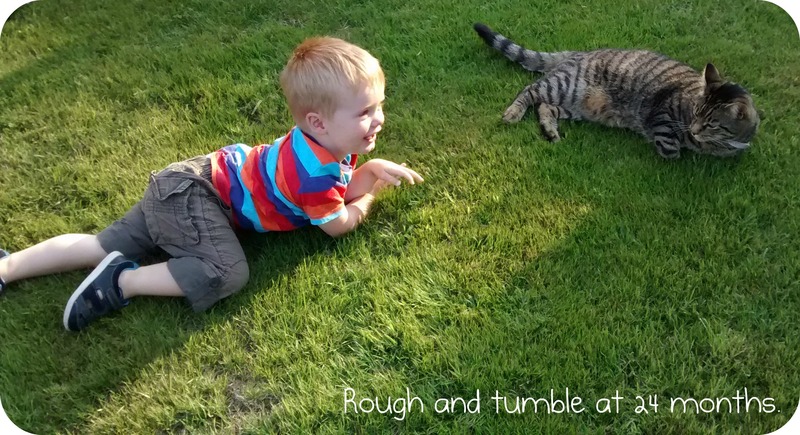 So, The Boy has spent two days in the garden (the sun was out – hooray!). We managed to get a fair few jobs ticked off the list. Hubby deserves an award for his sterling effort in the kitchen. We now have batches of chicken, sweet potato and apple casserole (plus purée form for Pipsqueak); pea and courgette soup (plus chunkier purée version); broccoli and courgette gratin purée; tomato, cauliflower and basil purée; bolognese portions and an amazing lasagne with surprise butternut squash layer… Nom nom! ‘Helping’ with the food preparation. The house is clean and tidy, bedding changed and kitchen cupboards given a quick tidy. Three more loads of washing have been line dried, folded and aired. The garden is a bit neater. But boy was it a juggling act! It didn’t help that poor little Pipsqueak is suffering from her fifty-millionth cold and cough. She has been snotting, wheezing and grizzling away instead of being her usual smiley self. Naps have involved lots of crying and resorting to rocking for at least 30 mins in the dark a la the Olden Days. But she was happy for a fair while in the Jumperoo and then in the ball pool. In fact, The Boy was infinitely more demanding than her. I present him with a ‘new’ (second hand) Scuttlebug. I set up the ball pool for Pipsqueak. The Boy dives in, sticks his tongue out and demands a photo. Hubby sets to the weeding. The Boy wants to help. He disappears into the shed and comes out wielding a garden fork with rather sharp ends. Close supervision is required from then on. The mini trampoline is brought out. Miro returns to our garden. The Boy is ecstatic and spends 5 minutes stroking him, tickling him and feeding him breakfast (grass). It’s lovely to see and Miro is very tolerant, but again a close eye is required as he will lash out if his tummy is grabbed or his tail pulled a bit too forcefully. A toddler version of a nerf gun is brought from the shed. 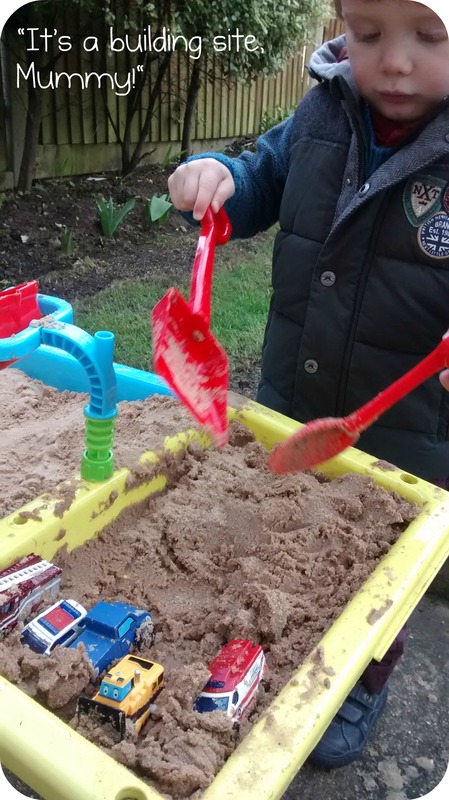 Other toys and activity stations such as the sandpit are left untouched. In short, The Boy just isn’t into independent play. Is this a consequence of his upbringing to date? We have always given him a lot of attention. Partly because it brings us pleasure; partly because we believe this is a good thing for development and self-confidence. He also gets a lot of one-on-one attention from Grandma when she has him. But has this led to an expectation of attention 24-7? Our recent road trip (Scotland, Wales). Just writing this list has exhausted me, and it’s not even an exhaustive list! Undeniably, these experiences have helped with his learning and development, especially as they are always talked about and analysed afterwards. I also feel that another positive is that he is not afraid of new experiences. 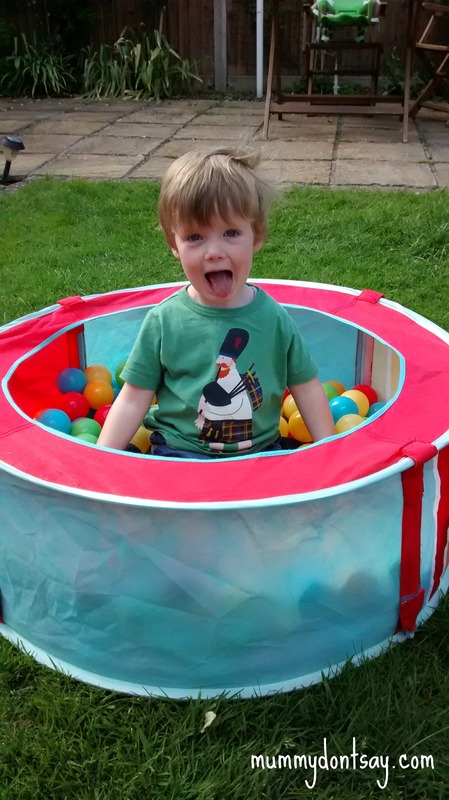 For example, starting preschool one morning a week at the age of 2½ was taken in his stride, and during his recent holiday he wasn’t phased by moving on regularly and sleeping in 5 different beds in the space of 2 weeks. Life is one big adventure! And don’t get me wrong, he finds a trip to the doctors and chemists just as ‘thrilling’ as many of the items on the list. As long as he has our attention 100% of the time. (Apologies to the doctor today who was constantly interrupted during our supposed 5 minute appointment: The Boy was on a high from playing with the Brio in the waiting room with full attention from myself and another elderly patient). It is probably one of those nature-nurture questions which could be debated until the cows come home. Or perhaps we should ‘blame’ astrology – he is a Leo after all, just like his mumma! We have just returned from a fortnight away. Call us crazy, but we thought it would be a good idea to travel (with The Boy and his 7 month-old sister) from the South Coast up to Scotland to see hubby’s folks for his birthday. Plane and train journeys, though infinitely more appealing than a car journey in many ways, were discounted due to the sheer amount of stuff we felt we needed to take with us (baby paraphernalia and an abundance of clothes mainly, what with the unpredictable British climate and our track record for instigating unsettled weather fronts whenever we choose to holiday). So, a ‘road trip’ it was. It sure wasn’t going to be akin to our Australian adventures 12 years previously, but we were willing to give it a whirl. A couple of weeks previously, we had finally upgraded our family car from a small but efficient Ford Fiesta to the obligatory MPV in the form of a Citroen C4 Picasso. The extra boot (and behind the front seat) space was a necessity now that the back seat next to The Boy was occupied by a Pipsqueak-shaped cargo. Rammed it still was, however: Lord knows how we will ever fit in our super sized tent, two-ring camp kitchen and all the other ‘essentials’ required for the future camping trips that I romanticise about! I imagine that most parents of toddlers (or toddler/baby combos) would experience a certain amount of dread trepidation at the thought of such a long period of confinement journey. I admit that perhaps a couple of episodes of night-time insomnia in the weeks leading up to our trip may have been attributable to nightmarish premonitions about what the trip might behold for us. But on the day we left I felt strangely gung-ho about the whole affair. 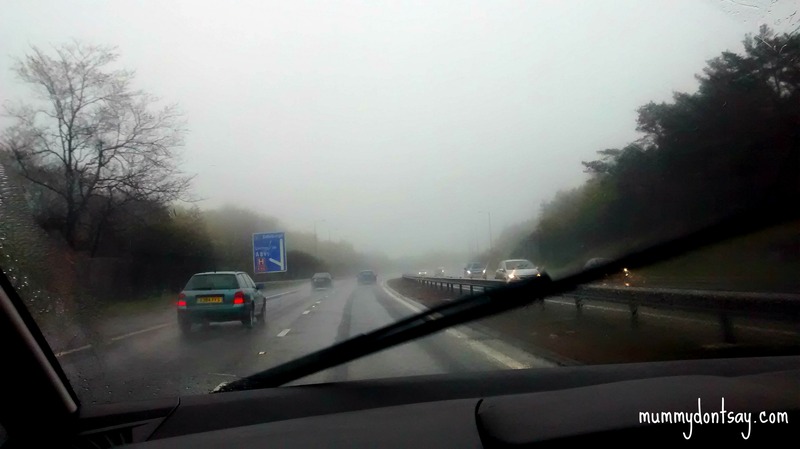 We had sensibly decided to minimise ‘risk’ by breaking up the journey into more manageable chunks, stopping for a Monday to Friday Centre Parcs break on the way up and a stay with friends on the way back. It was going to be just fine. 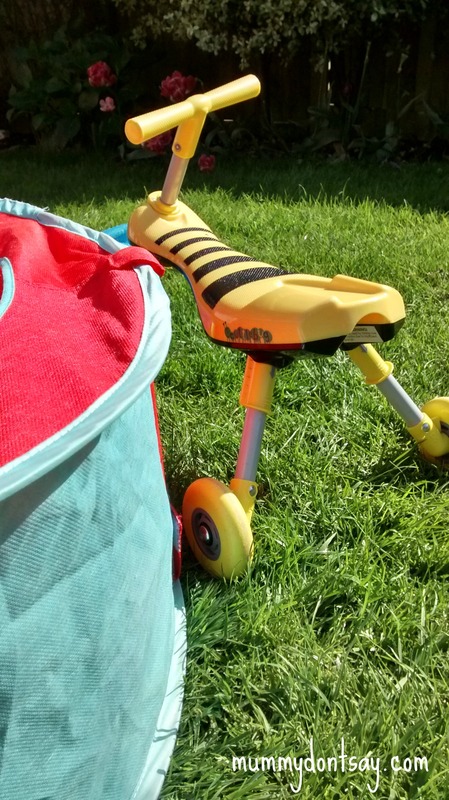 I had recently read a couple of blog posts about travelling with littlies. They recommended packing snacks galore, carefully planning service station stops timed around usual naps and eating routines and investing in seat-back DVD players. None of these survival strategies were executed here I’m afraid. For a start, we are (frustrated) owners of possibly the only toddler in the world who has not napped in the car during the daytime since he was approximately 6 months old. But he still typically snoozes for a couple of hours in his bed after lunch when we’re at home. He also never says that he is hungry so snacks are not a primary distraction. Furthermore, with Pipsqueak’s sleep all over the place, her daytime feeding aversion and being only recently weaned, predictable routines are non-existent. On a wing and a prayer, with our boxette of Julia Donaldson story CDs, a CBeebies magazine and a handful of music CDs selected to help us reminisce about our carefree days of freedom, we were off. The breadsticks were mistakenly left in the boot with the bag of essential foodie provisions (ie. proper coffee and tea bags plus a colourful array of Ella’s Kitchen purée pouches). As advised by the ‘experts’, the recently potty trained boy wore pants not pull-ups. An hour later, the traffic has been sluggish, we’re half the distance from home that we expected to be, the boy is white as a sheet and sobbing that he doesn’t “feel vewy well, Mummy,” and Pipsqueak is loudly complaining (screaming) about being restrained in a backward-facing car seat. We pull up at a petrol station praying for car sickness medication to find a boy with a very wet trouser area and sopping car seat cover (despite the well-placed waterproof sheeting). Things could only get better. And luckily they did. 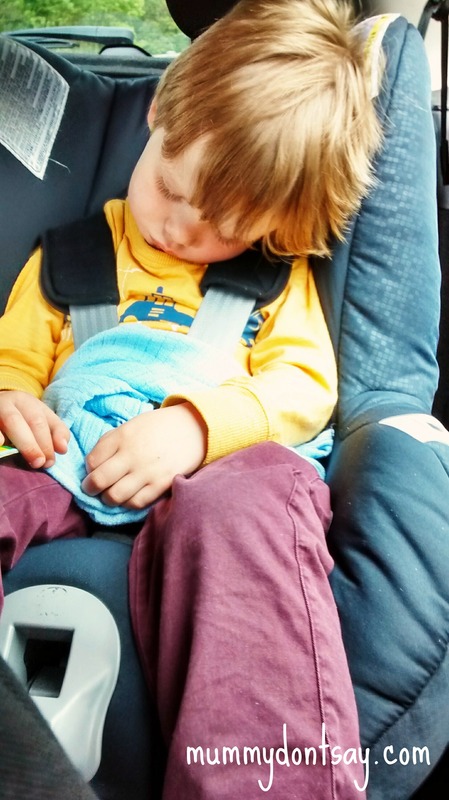 Pipsqueak relaxed and realised that naps were indeed possible in broad daylight, the boy felt better after some homoeopathic sickness remedies and a change of clothes and the ‘fun’ started. The Boy is renowned as being a huge chatterbox. This is the premise on which my blog is based. Granted, journeys always pass more quickly when there is some good banter, and he was pleased to oblige with the conversation starters and entertainment. However, we did encounter a bit of a technical issue which we didn’t really foresee. Namely, the inability to hear The Boy easily from his seat in the back. This meant that his chatter was punctuated regularly with us asking him to repeat himself more loudly; him repeating himself over and over as we craned and concentrated with all our might to fathom what he might be asking/saying and me (as passenger due to ongoing sleep deprivation) ending up with a cricked neck and strained side as I regularly manoeuvred in the front seat to lip read. Still, The Boy had a ball. He counted lorries. He spotted his favourite logos on said lorries (on the return journey, Kimberly Clark of all brand names could be added to his ‘wow’ list: a legacy of all his public toilet trips whilst out and about). He named transport types (including car transporters, coaches and caravans) and pointed out VWs, Fords and Citroens. He even enjoyed the miles of slow-moving roadworks (where he learnt to distinguish JCB and CAT diggers, rollers and bulldozers). He was in heaven when, on a services advertisement board he spotted M&S, Costa, Starbucks or McDonalds logos; if he spied the buildings themselves it was as though he awarded himself extra bonus points: his grin said it all. Between chatterbox moments, The Boy could be found reading his magazine in such a grown-up way (holding it like a commuter might on a train journey) or listening avidly to our music and asking about the track name and artist. (“Jack Johnson is a little bit similar to Bob Marley, Daddy.”) It is sometimes really hard to believe that he is only two years old! All in all, would we contemplate such a journey again? Yes definitely. On the way home, totally exhausted from all the excitement and exertion and an almost complete absence of naps throughout our trip, The Boy even slept in the car for over an hour. I could get used to this! Next time, though, I quite fancy the South of France for its weather! How I wish I could get inside the mind of my toddler sometimes! 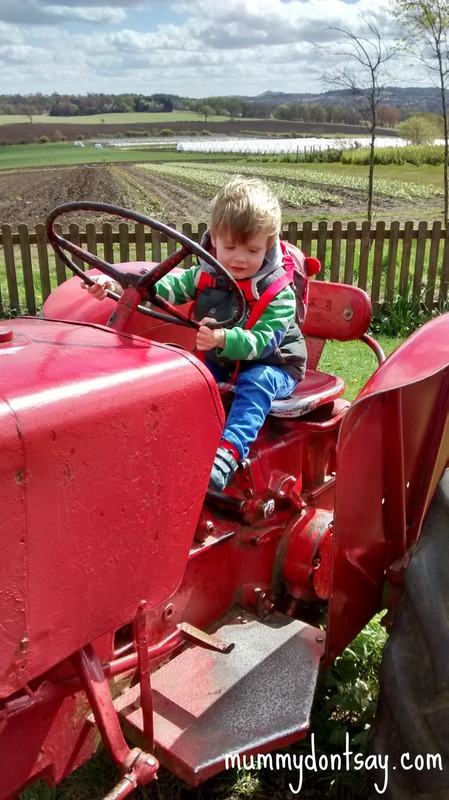 Yes, toddlerdom is clearly tough at times but the simple pleasures he finds in everyday life are both fascinating and spirit-raising. I feel so lucky that he so vociferously shares these pleasures multiple times an hour (in between more negative trains of thought, naturally!). #10: His sister (“I love youuuu”). Just creeping into the charts, Pipsqueak has waited 6 looong months to gain a space in her big brother’s affections. It has taken much charming on her part; smiling, cooing, reaching out to him and staring at him endearingly whenever he is within eye-shot. Finally, he now tells her he loves her, tells us he likes her, shows and teaches her things and has even been known on occasion to hold her hand, stroke her hair or kiss her goodnight. We have yet to convince him to actually cuddle her or hold her for ‘that’ frame-worthy photograph, however. With the purchase of Usborne’s ‘Lift-the-Flap Shapes’ book a couple of weeks ago, a new shapes obsession was born. 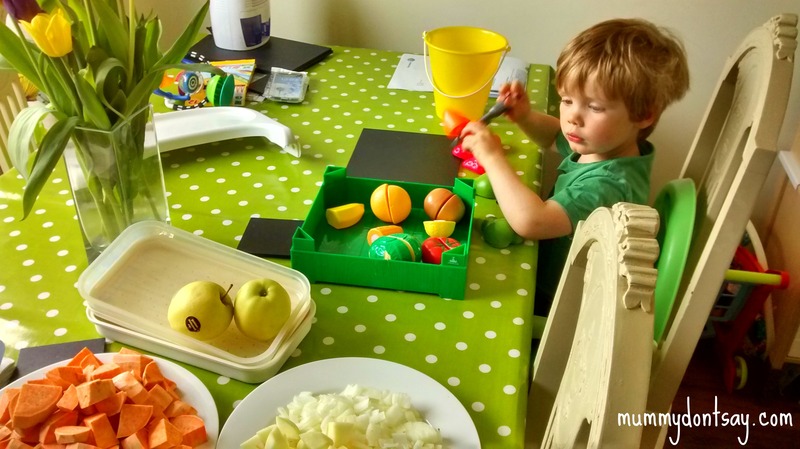 He points out shapes to his keyworker at preschool, and to us around the home and out and about. Much to our amusement, at the start of our recent potty training mission, he would do a little wee, stand up and declare “That one’s an oval, Mummy.” Whatever floats your boat, E! The Boy likes animals. I like that he likes animals. Maybe one day he could become a vet and earn bucket-loads of money whilst saving the lives of our furry friends. 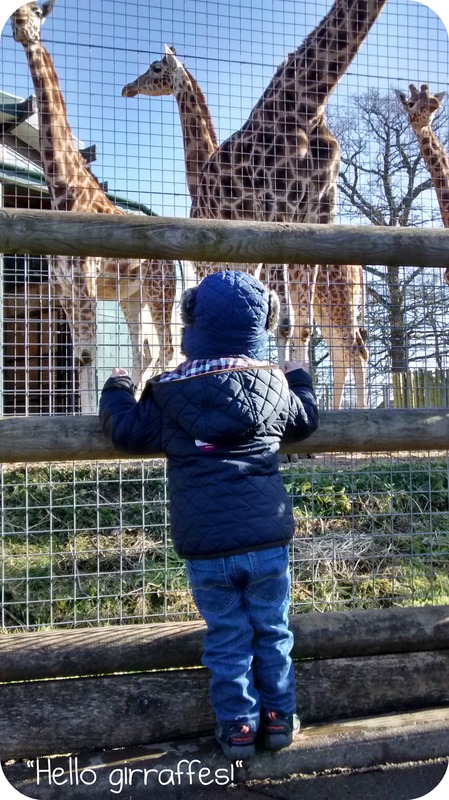 We are lucky enough to live just 20 minutes away from a really decent zoo, so of course we have taken advantage of this and have bought an annual pass for three years running. Many a memorable morning/afternoon/day has been spent at the zoo and I’ve loved witnessing how The Boy’s engagement with the animals has grown: From signing ‘duck’ and ‘tiger’ whilst flapping his arms or banging on the glass at 10 months to really observant and detailed descriptions now at 32 months. 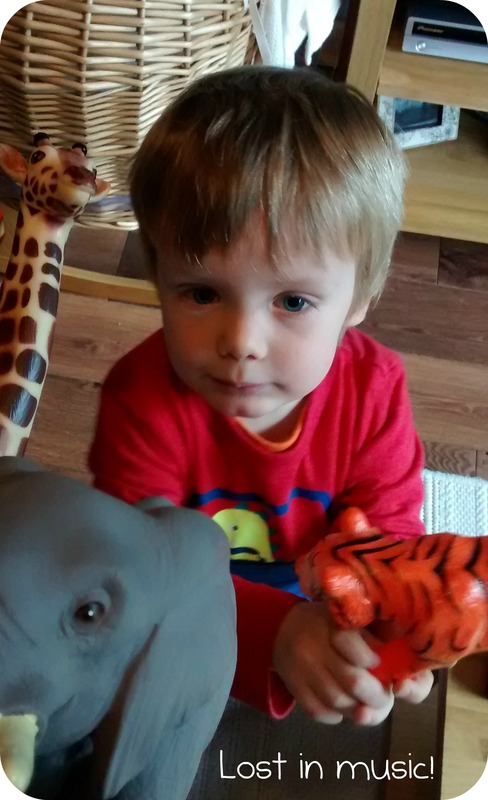 The Boy’s favourite animal at the zoo is the giraffe (the same as Mummy’s) and he can tell you lots of facts about them, including that they live in Africa and have black tongues. But, just to be a bit different, his second favourite is the mongoose. I wasn’t even sure what a mongoose was until recently! Please don’t judge! Honestly, in general conversation with The Boy, you would be forgiven for summising that we have spent his entire upbringing to date dragging him around the shops. This is so far from the truth it is laughable. 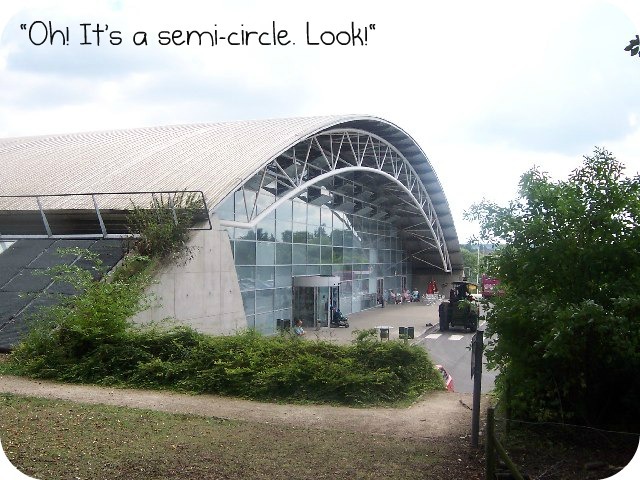 However, we do happen to have a rather large retail park style M&S practically on our doorstep and we *might* have made it sound like the most exciting place on the planet, just so that (once or twice a month) we can go and have a coffee in the café there. The tractor-shaped pasta and the escalators have become particular highlights of this ‘trip’ since the buggy has been ditched (before that it was the lift; before that sitting in a highchair and charming all the elderly ladies with his cutsie smile and baby babble). 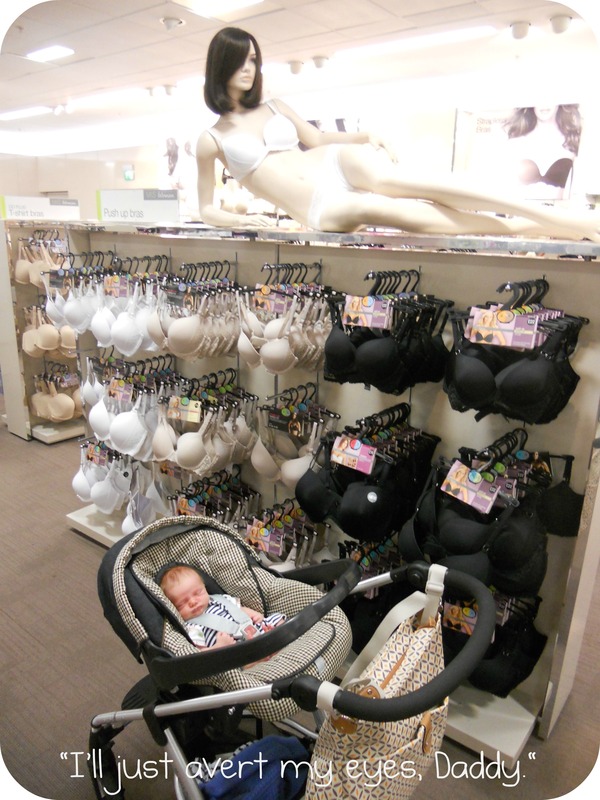 Mr Don’t Say maintains that The Boy’s love for this retail chain began as young as a week old, when we went emergency shopping for larger feeding bras and he ‘posed for the camera’ in the lingerie section. 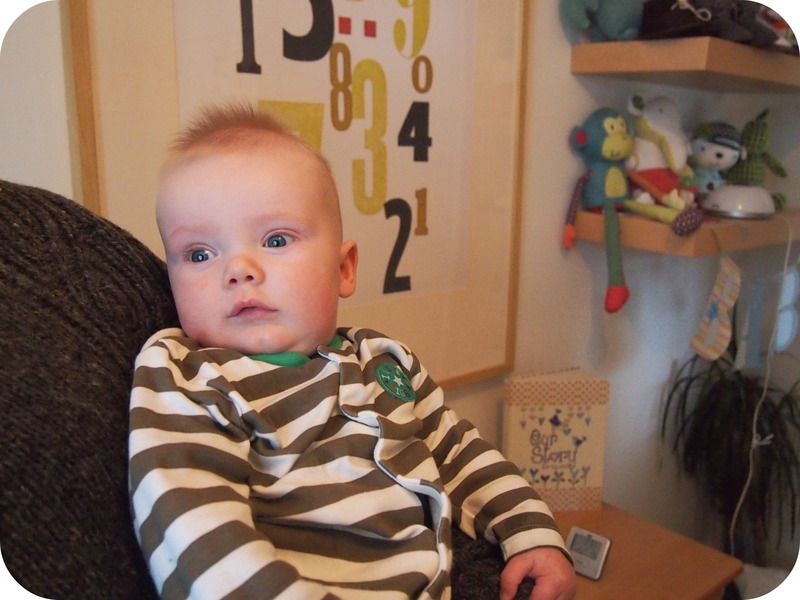 The Boy has been obsessed with numbers for a long time, too. This may or may not have had something to do with the rather large IKEA print that featured in his nursery (Mr Don’t Say often pointed the numbers out to him upon fetching him from a nap). I guess as a teacher I have encouraged this interest and we do count things often when out and about or when reading. But I do wonder what’s so special about ten. 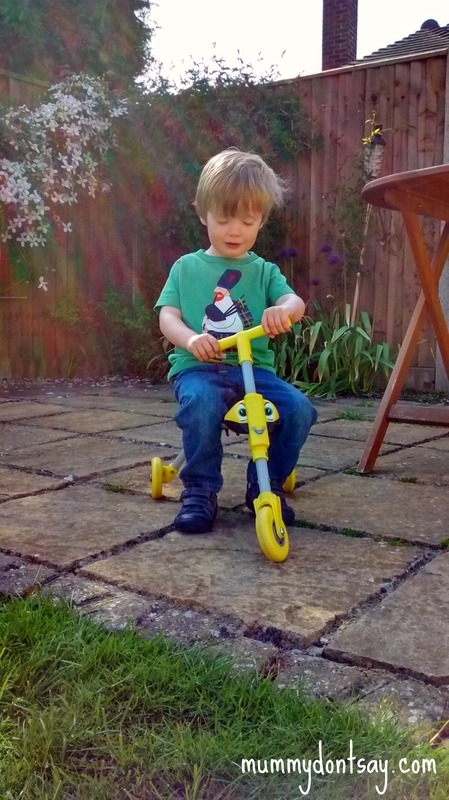 The Boy’s penchant for singing has been discussed in a previous post; he still declares daily how much he enjoys it. This has been clear to us from a young age: his first ‘sentences’ were heard down the monitor one evening as he finally added the words to his nightly hummed rendition of ‘Twinkle Twinkle Little Star’. I am fascinated to know how long this love will last and where this passion might lead him; he is pretty much note perfect nowadays. The school choir? Lead singer in a band? The sky’s the limit. The Boy’s love of dancing really became clear during a recent trip to a bouncy castle soft play area. This was somewhere we hadn’t been before, but we will definitely be visiting again. We went with The Boy’s best buddy who, upon entering the room, immediately began scrambling over and jumping off the soft play pieces, running around and generally making the most of the equipment provided. Meanwhile, The Boy stood in the middle of the mats absolutely entranced, swaying his body and staring into the distance. When quizzed, it became clear that he was trying to work out if he recognised the children’s song currently blasting out of the speakers. “I LIKE this one!” he declared excitedly as ‘I’m a Little Teapot’ came on, and he immediately broke into all the actions! Honestly, the amount of time spent on the equipment probably totalled 10 mins (and took some persuasion); the rest of the 90 minute session was spent dancing (often intentionally to the ‘audience’ of other parents: “Look at ME!”) and pointing out the numbers on the gymnastics posters on the gym wall! The Boy is a book junkie. He is absolutely hooked and extra stories are the ultimate bribe treat here. 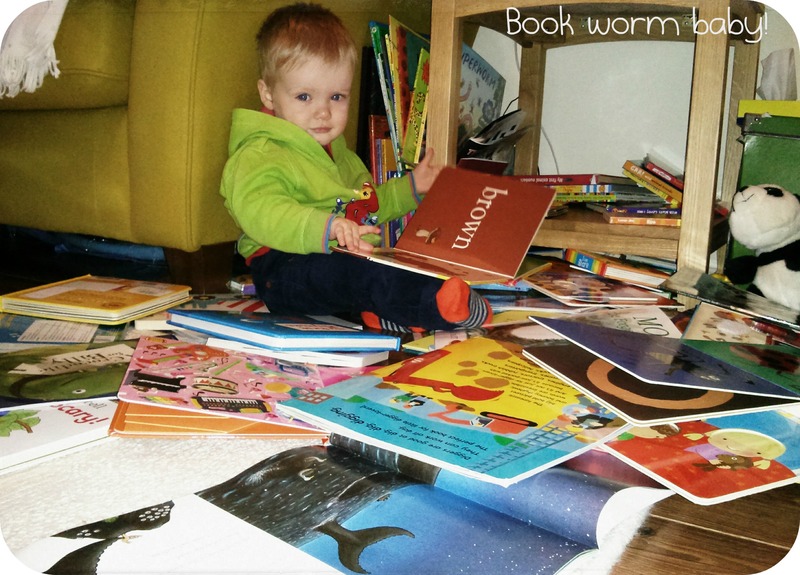 This is one boy whose eyes light up at birthdays and Christmases when he gets to open a ‘book shaped’ gift. Stories have never been reserved just for bedtime in this house, and I hope they never will be. They are constantly reached for, by The Boy himself, by us, and by his Grandma. I’m glad: we all get so much pleasure from reading with him. The staff at preschool did get a bit of a shock though when they asked what his favourite story was: “Anything by Julia Donaldson” was his confident reply! 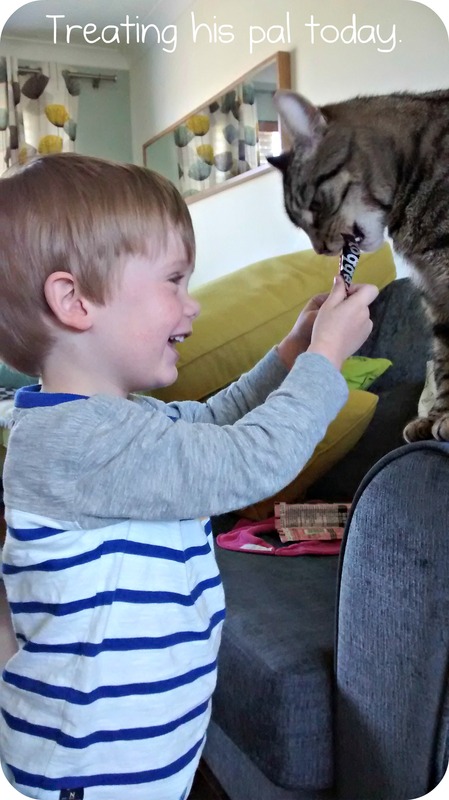 Any toddler who has grown up with a cat, dog or any other pet who is treated as part of the family is going to become very attached. Miro and The Boy have been hanging out together since he was about 4 months old. Luckily Miro is far more tolerant of The Boy than he is of us and puts up with a lot of rather rough cuddling, stroking and even tail pulling. This is probably mainly due to the fact that The Boy is the only one to really give him any attention during the day, as I can generally be found running around like a mad thing keeping the two little humans of the family alive and out of trouble! With a father who is a graphic designer and a mother hung up on displays as a teacher (and, if I’m really honest a bit of a sucker for certain clothing/toiletry brands), perhaps this interest was inevitable. But this interest is actually bordering on obsession! The Boy literally stops in his tracks wherever he is and whatever he is doing or saying if he spots a logo or label that he is familiar with. When he was just starting to talk, the main interest was in cars. Whenever he saw a VW, he’d point and say “Daddy car!”; for Fords it was “Mummy car!” Navigating car parks became very tricky and time-consuming, especially as he had to go up to a stationary vehicle and actually point to the badge, then circumnavigate it searching for further logos, for example on the wheels or number plates! Next came a preoccupation with shops. He recognised (‘could read’!) the wording and logos for Marks and Spencers (obviously), Co-op (“Co-op shop, Daddy!”), Sainsburys and TU clothing, IKEA and Next. He still points these out on packaged food items, carrier bags, clothing labels, branded lorries and advertising boards. Right now, he is also really interested in signs. Yes, any signs. The boy has always been a rather laid back sort (read ‘slow and considered in all he does’) but this makes walks about town infuriatingly slow! In order to ask his favourite question, “What does THAT sign say, Mummy?”, he has to stop, point, make sure that I am giving both the sign and him my full attention, get an answer and often get a detailed explanation! It is exhausting, but he is insatiable. Believe me, when we are out and about, we constantly get amused/incredulous/pitying looks from strangers. I do love our quirky little man. 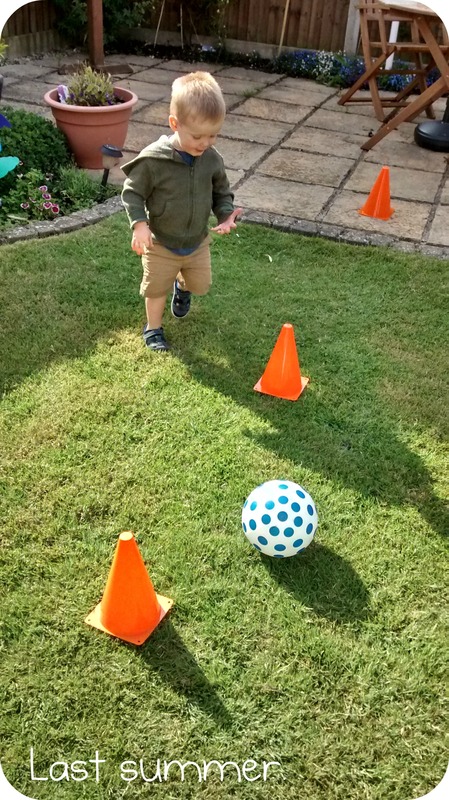 Running, bouncing on the trampoline, throwing the football around; we are all for encouraging these activities since physical accomplishments don’t exactly come naturally to The Boy. “I am GOOD at watering!” Which is quite helpful now he’s strong enough to hold his can and use it without soaking himself in the process. #slavelabour. 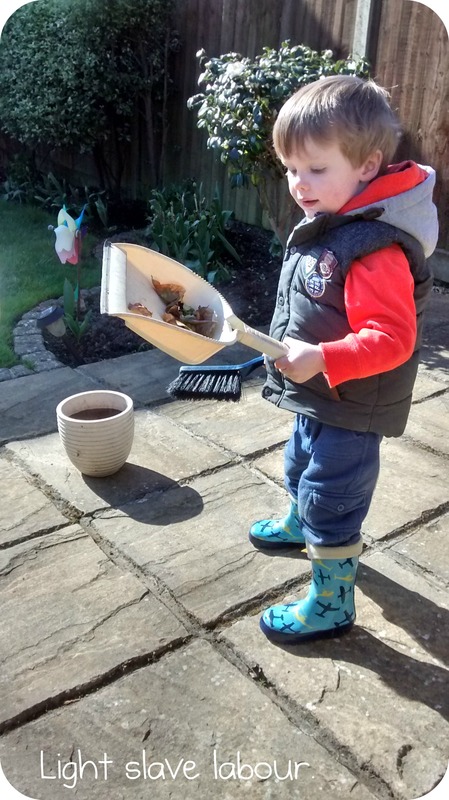 “Peease can I do some SWEEPING?” Top marks to Daddy who transferred The Boy’s love of the dustpan and brush at toddler group into another pretty helpful job – sweeping leaves from the patio. 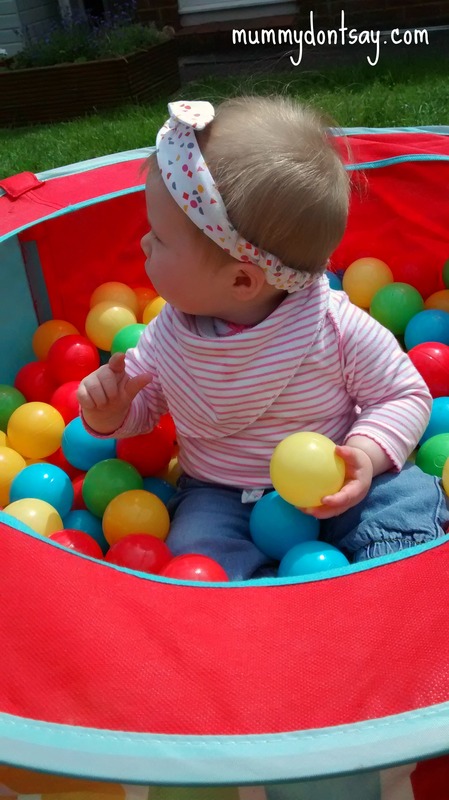 …And then there’s bubbles, the sandpit, the tent, the easel, picking daisies, mud pies, picnics: the list is never-ending and saved our sanity during our recent incubation period necessitated by a double-wammy of chicken pox. I adore witnessing The Boy constantly evolving in the way he engages with the world. I wonder what Pipsqueak will grow up to love? Are you following my blog? If you like what you see, please follow and spread the love. There’s plenty more where this came from! I am also found on Twitter @mummydontsay and post links to all new blog posts on my Facebook page. My two-year-old cracks me up. Every day. If you have read my first couple of blog posts, you will probably have already realised that he can be quite vocally demanding. Bossy, even. Show me a toddler who isn’t. But he is also quirky, mischievous and highly entertaining, and I love the bones of him. Part of the reason for me starting to record his little sayings in writing is because I want to cherish them forever. Childhood is woefully short and I know that even his most utterly frustrating outbursts will raise a smile and even have me reminiscing in the future. His ‘little gems’ (as I call them) will have me laughing out loud. Here is one of them. At lunch time today I was asked to sing a song. Keen to sustain his good mood, I asked what he would like me to sing. We started with a thankfully fairly succinct version of The Wheels on the Bus, then entered into an enthusiastic rendition of If You’re Happy and you Know It. So far so good. His little legs were jigging to the rhythm under the table. In between forkfuls he added the hand actions. His singing was endearing and even pretty much in tune (luckily it doesn’t look like he’s going to take after his dad in that department!). “Incy Wincy Spider peease Mummy,” he asked politely. So I gladly complied. He doesn’t often request this and it brings back hazy but fond memories of my own childhood. We sang it once through with aplomb. But of course. What else? And so another traditional rhyme is creatively adapted according to the whim of a toddler. Whereby the iPod is duly spurred into action. I have refused to download not yet got around to downloading any children’s songs onto it, but he takes great delight in boogying on down to a bit of Toots and the Maytals. His favourite trick is to reach up on tiptoes and whack the volume up REALLY loud. When I am not sighing in exasperation, I am smiling broadly as I remember the days when I too used to have regular opportunities to get completely lost in music. Which involves him emptying the whole box of toy instruments out onto the wooden floor with an Almighty clatter, then proceeding to bash and crash with much force on his drum, xylophone and pretty much any other hard surface within arm’s reach. If we’re especially lucky, the toy trumpet and the toy CD player will also be worked into the repertoire. Daddy is the sucker for this one. My morning head is not usually in the zone to comply. I want to sometimes listen to the news like a normal human being. But at the weekends, we are often listening to songs from his baby signing class or a number from the Julia Donaldson boxset that he got for Christmas. Then, by default, I am singing them either out loud or (worse) on repeat in my head for at least the next 24 hours. And when I decide to put on some chill out tunes for myself or listen to the radio? * This is most often requested when I’m just getting/have got the baby off to sleep.